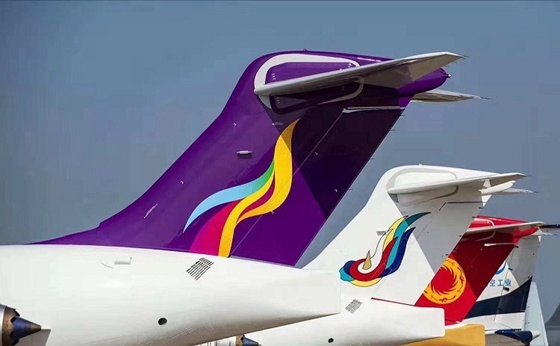 Three ARJ21 aircraft gathers in Zhuhai, and steady progress made in marketization development__Commercial Aircraft Corporation of China, Ltd.
Three ARJ21 aircraft with different paintings gathered at the airshow on November 6th, 2018. The opening ceremony of the 12th China International Aviation & Aerospace Exhibition (also known as Airshow China 2018) was held in Zhuhai on November 6th, 2018. Commercial Aircraft Corporation of China, Ltd. (COMAC), together with Chengdu Airlines, Genghis Khan Airlines and Urumqi Air, brought three ARJ21 aircraft with different paintings to perform flight demonstration and ground exhibition at the site of the airshow, and held a press conference. 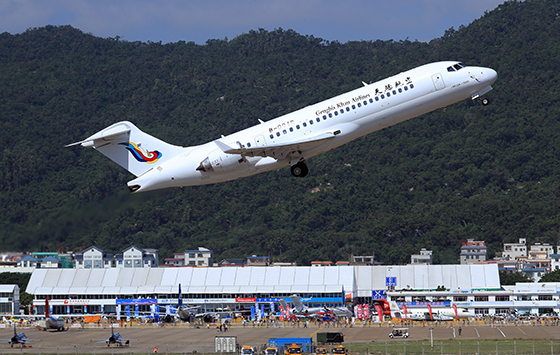 This is the first time that three ARJ21 aircraft gathers in Zhuhai, indicating that the number of operators of this China-made regional jet is increased to three, and steady progress has been made in the marketization development. Mr. Shen Zhulin, Deputy Director of Department of High-Tech Industry of National Development and Reform Commission (NDRC), Mr. Zhao Yuerang, Deputy Secretary of the Party Committee and President of COMAC, Mr. Cheng Fubo, Member of Standing Committee of the Party Committee and Vice President of COMAC, Mr. Tang Jin, Chairman of Chengdu Airlines, Mr. Hao Yutao, Chairman of Genghis Khan Airlines, and Mr. Han Luhai, Chairman of Urumqi Air, attended the press conference at the site of the airshow. 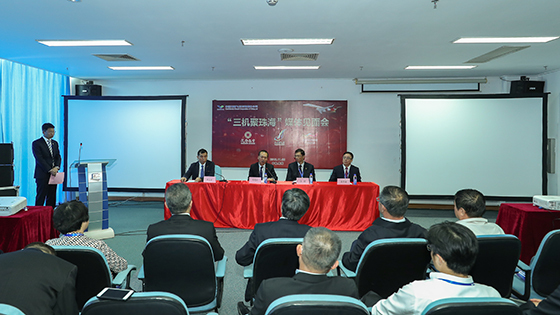 Mr. Zhao Yuerang expressed that the gathering of three customers' ARJ21 aircraft in Zhuhai indicated that the industrialization and marketization progress of the China-made regional jet had been accelerated, and the support for steady development of China-made commercial aircraft had been growing. COMAC had been committed to providing safer, cost-effective, comfortable and environment-friendly aircraft for customers, and creating value for customers. COMAC would work with airlines in the future to explore and practice the business mode of combining trunk and regional lines, which is suitable for the specific situations of China, based on the operational characteristics of ARJ21 aircraft in different regions and different route structures, explore potential to create market, continuously expand the operation scope of ARJ21 aircraft, and make contributions to improving the air transportation efficiency and accessibility in China. Of the three ARJ21 aircraft, one has already been delivered to Chengdu Airlines by COMAC, and two will be delivered respectively to Genghis Khan Airlines and Urumqi Air. These three ARJ21 aircraft with paintings of different airlines flew through the sky over Zhuhai in turn in the morning of November 6th and will be shown to exhibitors and the public in the following airshow professional days. 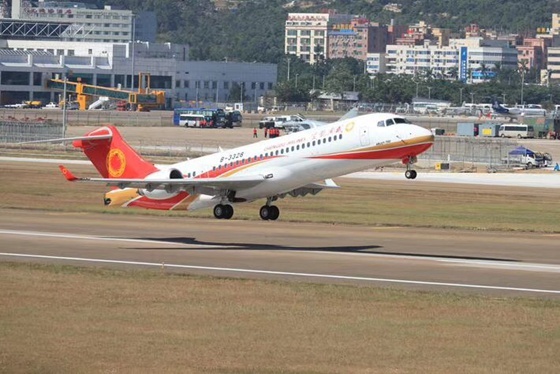 Chengdu Airlines, as the first operator of ARJ21 aircraft in the world, has successively operated eight ARJ21 aircraft in the routes to 20 cities including Shanghai, Changsha, Zhoushan, Shangrao, Wenzhou, Linfen and Taiyuan. The aircraft have accumulated more than 6,000 flight hours safely and carried more than 180,000 passengers. For the convenience of extensive travellers, Chengdu Airlines has opened three new routes operated by ARJ21 in 2018/2019 winter and spring seasons, and thus the operation scope is further expanded. Genghis Khan Airlines, as the first regional airline in Inner Mongolia, has been approved by Civil Aviation Administration of China (CAAC) to make preparations on March 30th, 2018 and signed a aircraft purchase agreement with COMAC on October 15th. 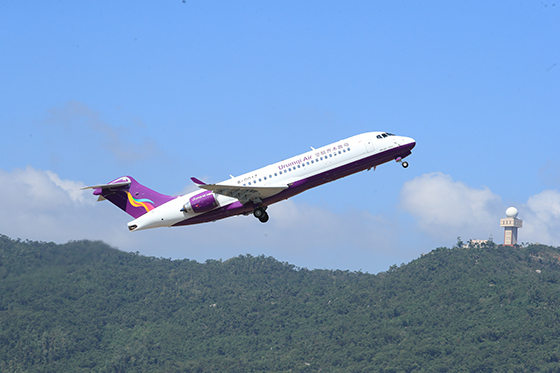 It will receive the first batch of ARJ21 aircraft by the end of this year and launch the maiden flight in 2019. Urumqi Air is jointly established by Urumqi Municipal Government and HNA Group, and is the only local airline in Xinjiang. 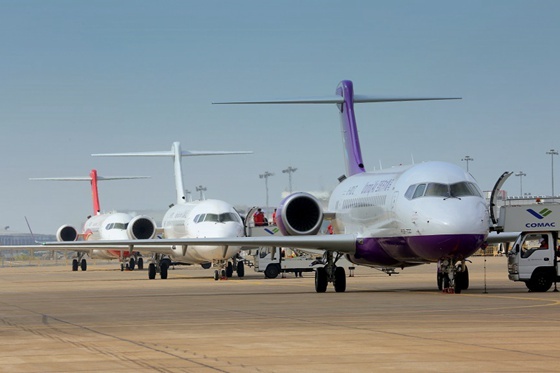 Urumqi Air has signed a agreement with COMAC during this airshow, confirming to receive five ARJ21 aircraft by the end of 2019. More than 100 ARJ21 aircraft are expected to be delivered to airlines over the next five years. While continuously increasing the production and manufacturing speed, COMAC has paid close attention to product quality, implemented product quality requirements with the method of "four irons", i.e. "iron discipline, iron requirement, iron means and iron accountability", adopted the method of "returning to zero in technology and management" based on system engineering, and established safety management system to strictly control product quality. To ensure the safe and smooth operation of ARJ21 aircraft, COMAC has given full play to its localization advantage, rooted in Chinese Market, established an operation support system, provided 24/7, all-weather and seamless operation support. At the same time, COMAC has actively carried out design optimization based on the feedback from airlines and passengers to continuously improve the customer and market recognition of ARJ21 aircraft. A photo of the ARJ21 aircraft of Chengdu Airlines. Three ARJ21 aircraft gathered in Zhuhai on November 6th, 2018.